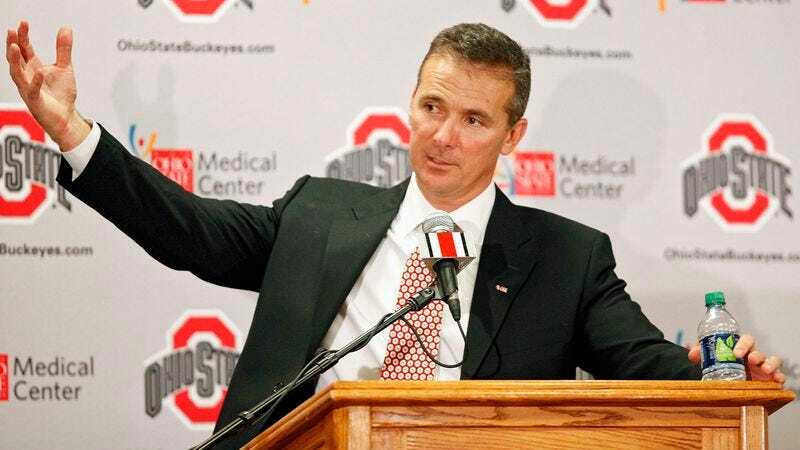 COLUMBUS, OH—Saying he missed the thrill and challenge of chest pains, breathing difficulties, and rapid fluctuations in blood pressure, two-time college national champion football coach Urban Meyer announced Nov. 28 that he would take the head coaching position at Ohio State. "What can I say, I have that arachnoid-brain-cyst-that-could-cause-severe-neurological-damage itch, and I need to scratch it," said Meyer, who added that his gut was telling him to leave the commentator's desk behind and get back out on the sidelines for another chance at collapsing from a heart attack in front of his players. "Once you get the run-yourself-into-the-ground-with-unbelievable-stress fever, it never quite lets you go." Meyer will reportedly meet with existing coaching staff as soon as possible to get started on strategy, dehydration, and headaches.